Episode 19 of the Rewards Canada Podcast is here! This week we talk systemwide hotel promotions, RBC Cathay Pacific sign up bonus, the AIR MILES apology letter and why you should get the Starwood Preferred Guest Credit Card from American Express, heck listen to the podcast to see how it can get you a $5,000 hotel stay for under $1,500. Find all the details on our podcast page! 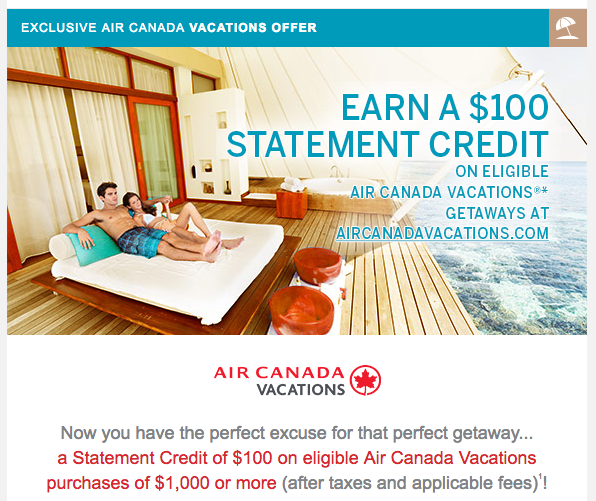 Check your email for an $100 American Express statement credit when you book an Air Canada Vacations package. I was targeted for my Platinum Card but this could potentially be for other card types as well. Marriott's Hotels weekly e-breaks are here. 15 Canadian hotels are up with special deals for stays this weekend only. Find out more here.